Welcome to the four hundred and sixtieth of my blog interviews with novelists, poets, short story authors, biographers, agents, publishers and more. Today’s is with children’s / YA author Margot Finke. A list of interviewees (blogged and scheduled) can be found here. If you like what you read, please do go and investigate further. Morgen: Hello, Margot. Please tell us something about yourself, where you’re based, and how you came to be a writer. Margot: My name is Margot Finke (silent T silent E). My husband says they are the only silent things about me. I spent the first half of my life Down-under. Then I met and married an American from New York. I became a transplanted Aussie when, many years ago, we came to live in Oregon with our then three young children. Now grown, they have done their duty by presenting us with four delightful grandchildren. I have always scribbled, but the habit became really serious when I got a job as a Teacher’s aide. Kids thought I talked funny, so I told them I was an Aussie from Down-under, where all those weird and wonderful animals lived. Next came stories about Australia and its animals, right off the top of my head. My teacher friend said. “For goodness sakes, Margot, write them all down so you don’t forget them.” So I did. 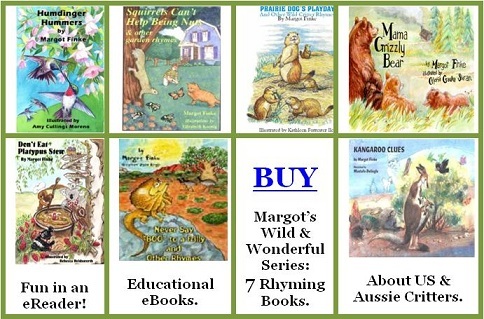 They became “Wild and Wonderful,” my 7x book rhyming e-series of facts about US and Aussie critters – fun, as well as educational. I now have 11 children’s books published, with another young teen adventure coming later this year. Morgen: I like your husband already. 🙂 What genre do you generally write and have you considered other genres? 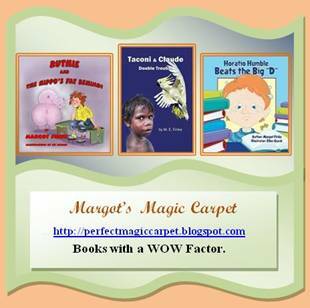 Margot: I write rhyming picture books and mid-grade or young teen books. I would love to write a romance novel or a mystery – I so enjoy a well-written mystery. If they added a few more hours to each day I might manage it. But promoting books takes huge chunks of my time: writing them is the easy part. So I blame time. Time and my husband. You see we have a deal. Now that he is retired, he has happily taken over the garden work and the cooking. This leaves me lots of time for writing, promoting my books and helping new writers. I also run a very busy Manuscript Critique Service, with clients from numerous countries. So our deal is that I quit the computer at 8pm, and spend the rest of the evening with him. I unwind, clear my head, AND save my marriage. A pretty fair deal. Morgen: Sounds good to me (and I blame time too, there’s never enough of it). What have you had published to-date? Do you write under a pseudonym? Margot: No pseudonym, mate. A name like Margot Finke is not easily forgotten. This is a GOOD thing for an author. When people hear my name they think Kid’s Books or Manuscript Critiques. Rattlesnake Jam – fun and games with Gran, Pa, and green rattler jam. But will Gran make the rattlesnake pie Pa craves? Ruthie and the Hippo’s Fat Behind – how sudden big changes can make a brat out of your child. Horatio Humble Beats the Big D – Horatio is smart, but he could not read. Dyslexia was the verdict. No way would he go to Special Ed – but go he did, with amazing results. Taconi and Claude – Double Trouble – young teen book for boys and tomboys: a coming of age adventure. Set in the Aussie outback, with a chatty cockatoo, a man ceremony, Dreamtime, a magic feather, and big decisions for Taconi to make. There are links to Videos of me reading from all of my books on my website’s homepage. Morgen: I love those titles. Have you had any rejections? If so, how do you deal with them? Margot: There is a saying among writers that you usually receive enough rejection letters to paper a small room (think bathroom) before you finally get an acceptance. I defiantly qualified! Deal with them by reading each one with great care. In the beginning they are probably just standard boilerplate. Later, when comments or suggestions creep in, you know you ARE getting there. Take note of all the suggestions and keep reworking the story until someone says YES! More rejections are sent out because the writer targeted the WRONG publisher, than any sent for lousy writing. Research the publisher. Read their online Submission Guidelines. Do exactly what they say. Check the publisher’s current list of books, and make sure yours is a good fit. If you write animal stories or travel tales, and the publisher has no animal picture books or travel tales in their current line-up of books – look elsewhere. Morgen: I know some authors who have received feedback (rare) but taken them as rejections and done nothing with the story – until they were told (not just by me) that feedback showed promise. Do you have an agent? Do you think they’re vital to an author’s success? Margot: I have not needed an agent to get my 11 books published. However, now that I am working on more young teen books, that might change. Margot: All of my “Wild and Wonderful” series are e-books. The rest of them are in multiple formats: soft cover, ebooks, Kindle or Nook. In each case my publisher did the e-books for me. I have two other non-rhyming picture books ready to publish, and I am looking for a partnership between an interactive illustrator and myself as writer. I read in any format. I think there will always be a place for paper books, as well as what future technology throws our way. I am sure interactive stories on iPad, iPhone, Kindle and such will be HUGE in the near future. This is an exciting time for anyone interested in innovation. Morgen: I’m excited. 🙂 How much of the marketing do you do for your published works or indeed for yourself as a ‘brand’? Margot: Just about all of it. Publishers today mostly leave the bulk of promotion to the authors. They might send out a few books to reviewers, and take care of distribution and a few Press Releases. Of course if you are famous, or a best seller, this changes. You get red carpet treatment. Most of us do our own Press Releases, arrange book signings, school visits, Radio and newspaper interviews etc, and lots of online promotion wherever we find a place that is receptive. Morgen: Like here. 🙂 Do you have a favourite of your books or characters? If any of your books were made into films, who would you have as the leading actor/s? Margot: Whatever I am writing at the moment has my favourite character. And it would be hard to pick an actor to play Taconi – as he is an Aussie aboriginal: easier to find a cockatoo to play Claude! Morgen: 🙂 Did you have any say in the titles / covers of your books? How important do you think they are? Margot: The cover of a book is what catches the eye and draws prospective readers. So it must have kid appeal, and hint at the characters within. No fussy details either. There is an art to illustrating books and doing stunning covers. Not just any artist has this gift. I have been published by small publishers. This allowed me to have input regarding cover art and illustrations. Big publishers have large art departments, and you often don’t see the cover or illos until the book is published. All my books kept their original titles. Morgen: Which is probably a big factor for why many authors go with small publishers. What are you working on at the moment / next? 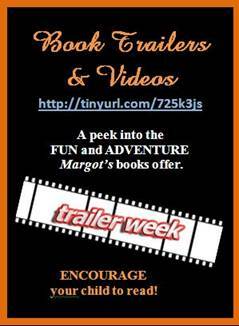 Margot: A sequel called Survival by Walkabout, to follow Taconi and Claude. I am also polishing two other mid-grade novels and looking for publishers for them. One is a ghost story set in Oregon, titled “The Revenge of Thelma Hill.” The other is “Down-under Calling,” letters back and forth, plus the daily lives of a Grandma and her Grandson, living on two different sides of the Pacific Ocean. Morgen: I like the sound of those. Do you manage to write every day? Do you ever suffer from writer’s block? Margot: Afraid not. Manuscript Critiques and book promotion take a lot of my days. I try to squeeze in more writing whenever I can. No writer’s block either. My mind is always a whirl with characters, plots, and ways to make them HOOK kids on reading. Morgen: Me too, although not with children’s stories. Do you do a lot of editing or do you find that as time goes on your writing is more fully-formed? Margot: I must say that my rough drafts these days are far better than when I first began writing. My first drafts are the bones of the story, and like any skeleton, they need fleshing out. The fun comes when you add details, nuances, enrich characters and plot with back story, plus the occasional flashback. Creating a new world of places, plots, and intriguing characters is what HOOKS me on writing. Margot: Research is for when I don’t know background, or history, or culture. I researched my “Wild and Wonderful” series books, to make sure the facts were correct. And even though I grew up in Australia, I did research for certain aboriginal details in Taconi and Claude. Margot: Third person is easiest to write. First person is not for beginners – can be tricky to get it right and make it feel natural. Never tried second person. Morgen: It’s fun – Steve Jackson and Ian Livingstone used it for their adventure books (which I loved growing up so possibly why it’s my favourite viewpoint now). What advice would you give aspiring writers? Margot: Join a good critique group, and take note of the comments and suggestions offered. You can learn a lot from reading the MS of others. Like any other job, writing is a craft that must be learned. The best things a new writer can do is have patience, perseverance, and enjoy rewriting. Network on-line with advanced and published writers. Pick their brains. Writers who stick with it are the ones who become published – and a little luck is not to be sneezed at, either. Morgen: I love that. If you could invite three people from any era to dinner, who would you choose and what would you cook (or hide the takeaway containers)? Margot: Hillary Clinton, Elizabeth the First of England and Mark Twain. I would be too excited and nervous to cook. I would book a really good restaurant. Morgen: It would mean you’d have more time to chat. Is there a word, phrase or quote you like? Margot: Write tight and terrific – as tight as your granny’s new girdle. Morgen: <laughs> You mentioned marketing earlier, are you involved in anything else writing-related other than actual writing or marketing of your writing? Margot: A Manuscript Critique service: http://myplace.frontier.com/~mfinke/Manuscript%20Critique.htm#crits. Several wonderfully generous ladies mentored me when I started writing, so for a long time I critiqued stories for free: a kind of pay back for the early help I received. Then a friend told me I should charge a fee for all my time and hard work, and so my official critique service began. I now receive manuscripts from many different corners of the globe. My website also offers a great deal of free help and links for writers, theres a video of me chatting about Manuscript Critiques. Margot: Travel, gardening, grand kids, and of course reading, reading, reading. Pretty dull eh? Morgen: Not at all, I’d love to read, read, read (and my garden would appreciate a lot more attention than it gets). Instead I blog, blog, blog and email, email, email. 🙂 Are there any writing-related websites that you find useful? Margot: There as so many forums and social networking sites, that if you aren’t careful, they swallow you whole. Choose ones that suit what you are prompting. I like certain Facebook groups. Google+ is great because you can target the circles that work for you. I have circles for Teachers, Writers, Publishers, Reviewers, Book Stores, Librarians and more. This way you send only what interests each group, instead of a blanket message that might only fit 30% of readers. Twitter also is good for a fast-targeted message. Then there’s Linkedin – the no nonsense business list. Great for asking questions, your resume, showing off recommendations, getting answers, and branding your name. The more helpful you are on Linkedin the better. Finally there’s JacketFlap. A terrific place to find publishers, look for books, promote your own books, blog site and skills. Oh, and Pinterest. This is new: a place to “pin” pictures of anything from anywhere. My book covers and inside illustrations are featured pictures, along with my blogs, and the blogs, books and stuff of others that catches my eye. A super showcase for something you want to promote. I am active on ALL of these. See where my promotional time goes? Morgen: I’m on all the above (and find them the same as you) but not heard of JacketFlap – will definitely have to look at that one. Where can we find out about you and your work? Margot: I have a video of me reading an excerpt from Taconi and Claude – Double Trouble? Thank you so much Morgen, for interviewing me and allowing me to meet your readers. Morgen: You’re so welcome. Thank you, Margot, for taking part. Set in the Aussie outback of 1950, this historical young teen adventure offers a coming of age story, aboriginal lore, Dreamtime Spirits, + big decisions for young Taconi to make. He is helped by Claude, his chatty cockatoo; spouter of wise and funny one-liners at just the right moment. An elusive magic feather, a crazy dad, and the marvel that happens after a huge tribal gathering, all bring answers that help guide Taconi’s future. 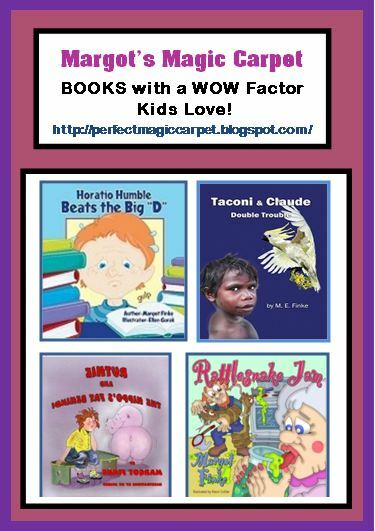 Children’s Books make terrific Holiday gifts. Pick some from my free Book Catalog. My ghost mystery, “The Revenge of Thelma Hill,” is now available on Kindle, Nook, Smashwords and elsewhere. A young teen adventure that has Frannie and her reluctant twin brother helping a ghost get revenge on the man who killed her. A missing mom, and a giant arachnid “familiar” add goose bumps with every page you turn! As I wrote this, the ghost seemed very familiar to me. Then it hit me – I was channeling my dear mom. So I thought what the heck! I will name her after Mom as well, hence the title. Mom would be so tickled to be featured in a book of mine. I still miss the dear lady! Also out now is “Mama Grizzly Bear,” the first in my “Wild and Wonderful” picture book series published in soft cover. All 7x will soon be available in soft cover as well as ebooks. Powell’s Books, Amazon, Publisher and more. ** Find all soft cover and Kindle books of mine on this Amazon page. And Awesome Agy Wilson and I are in partnership regarding my two latest story books. Agy will illustrate and animate them, and I have already written the stories. They should be available early in the new year. While the two characters await publication, they kidnapped my blog. Kobi and Oscar now run wild there: http://Ozfriends.blogspot.com. That’s all that is new – for now anyway!! And the young teen ghost mystery, The Revenge of Thelma Hill I mentioned in the interview, will also soon be on Kindle etc. All three are my first forays into self publishing, in partnership with Agy Wilson, the illustrator/animator. Finally, Mama Grizzly Bear, from my Wild and Wonderful ebook series, will soon be available in soft cover, as well as ebook versions, thanks to Guardian Angel Publishing. The rest of this series will soon follow in soft cover. So you can see that a LOT has happened since I filled in your interview form. Thank you for the opportunity to add this update. This is a really nice interview with a great deal of information to grow our marketing. Thank you both. I enjoyed this interview (Margot Finke). I would like to ask if you’d be able to read and critique the first chapter of my second book in “THE WIG” series. Certainly, Renata. I’ll email you. Renata, thanks for your comment. For one wild moment there I thought you were asking me to critique your MS.
Una, thank you also. I love when something I write proves helpful to others. Makes it all worthwhile.